January 13, 1926. "Violet Ray treatment on white rats at Agriculture Dept." National Photo Company Collection glass negative. View full size. Submitted by Dave on Sun, 10/05/2008 - 10:47pm. If you're interested in what's going on in this photo, I recommend Carolyn de la Peña's book The Body Electric. She writes about similar devices and attempts to energize the body through electricity and radium. Submitted by carpwoman on Mon, 09/29/2008 - 9:26pm. Had a brother named Man. Goofy lad, he was. Submitted by Dave M. on Mon, 09/29/2008 - 6:37pm. The guy holding the rat is not wearing goggles. He probably had sandy eyes when he got off shift. Submitted by stanton_square on Mon, 09/29/2008 - 5:08pm. I think at the time, the belief was more focused on the potential benefits of new-fangled scientific electric rays. Cows love to stand in the stanchions on cold winter days and bask in the violet rays from an electrical apparatus over them. Hens rush into the room where the rays are disseminated, ruffling up their feathers as though they were locating a nice, soft pile of dry dust. The United States Department of Agriculture has taken notice of these facts. Dr. E.W. 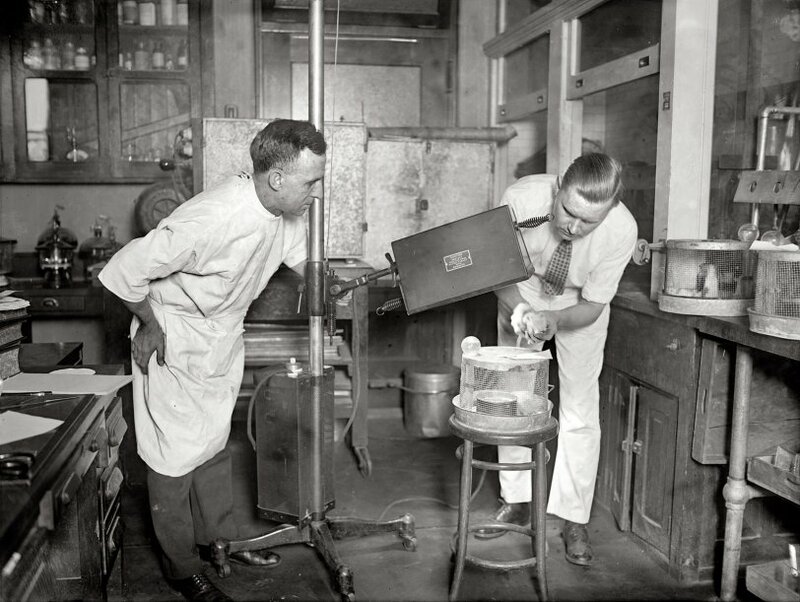 Allen, chief of the department's experimental stations, says that not only do cows and hens like it, but the treatment makes the quality of the milk and eggs much better and that babies fed such milk are practically immune to rickets. The violet ray method of improving farm output is approved by the Government and is being adopted by more farms each year. Dr. Allen says: "Nobody knows why a little sunshine or its substitute, an electric ray, playing upon the backs of cows and hens, results in better milk and fertile eggs, but it is so." Submitted by Anonymous Tipster on Mon, 09/29/2008 - 2:27pm. I wonder what experiment the Dept. Of Agriculture is performing in the picture. The light source bears a warning label which indicates the use of unshielded ultraviolet light. We now know unshielded UV light is useful in treating psoriasis and vitiligo while excess exposure causes cataracts and skin cancer. Perhaps they wanted to see if the light would drive the rodents from a food source. Submitted by Eric on Mon, 09/29/2008 - 1:49pm. This is still done today although in a much safer manner. I used to work at a large pediatric cancer facility and the mice and rats often had this done to research the resultant tumors. However, it's done quite humanely. Submitted by Tut on Mon, 09/29/2008 - 12:21pm. I used to know a Violet Ray . . . had a sister named Gamma.